NTU Chamber group historically hosts an annual recital of remembrance & Thanksgiving to serve the community. The annual recital provided an opportunity for the students to perform in public. It provided a platform for the musicians to learn from each other and the event also served as a social gathering for the parents and the teachers. Besides annual recital, the group performed in churches, in Chinese festivals and homes of the group members and friends. Sometimes, the group was invited to perform in supporting the recitals from the other musical groups. 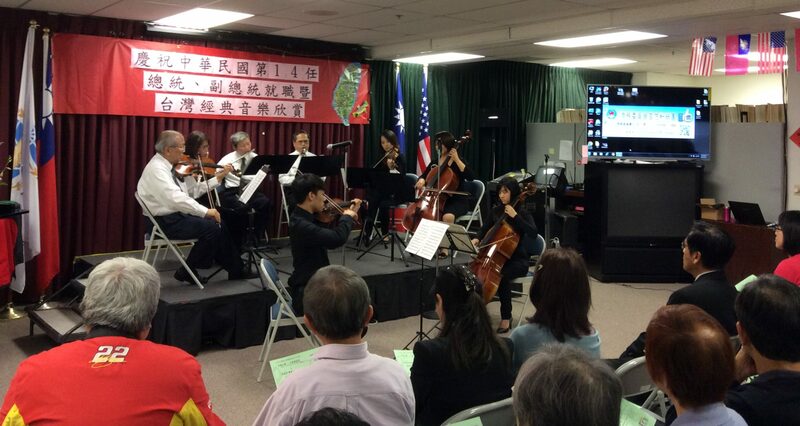 Last year, the annual recital was moved earlier to June as a way to refresh the memories of Dr. Ming Wu and my father. We were grateful that Irvine First Presbyterian Church provided the Sanctuary for our annual recital. In the recital, the group performed Mozart piano quartet K-478, 1st movement. Woodwinds (flute, clarinet and bass clarinet) were added to double the string section. The scores were previously prepared by Ming. The video clips in this blog was edited from the recorded DVD. Pastor Chung gave a short sermon message after the first Part. Most of the players are/were Ester’s students. Talented young musicians gave solo performance in this recital. Sarah Chang won several first-place awards in local piano competitions. Samuel Chen is the concert master in a local youth symphony. Ms. Ester Chen conducted the group. Most of the players are/were her students. Greg Hung recorded the concert and prepared the DVDs for distribution. I edited the video to present this clip of Salut D’amour. In my daughter’s wedding on December 20, 2008 I performed this classical piece as a special music. Elgar finished the piece in July 1888, when he was engaged to be married to Caroline Alice Roberts, and he called it “Liebesgruss” (‘Love’s Greeting’) because of Miss Roberts’ fluency in German. When he returned home to London on 22 September from a holiday at the house of his friend Dr. Charles Buck, in Settle he presented her with it as his engagement present. (Quote from Wikipedia). Sarah Chang (violin) Violin and piano. Joanna Westers (violin) Violin and piano. Clara Garde (violin), Marie-Benedicte Cohu (Piano) Violin and piano. Helen Cho (violin), Harold Wu (piano) Violin and piano. Young-nim Ma (violin), Miyang Kim (piano) Violin and piano. Valerie (violin), Dominique (piano) Violin and piano. Ferenc “Pepe” Mocsár (cello) and cimbalom Violin and cimbalom. A. Usami (flute) Flute and piano. Karen Constant (violin), Yleesh Constant (cello), Elena Semenets (piano) Violin, cello and piano. Danny Takagi (violin), Yumiko Moro-oka (cello), Mariya Ando (piano) Violin, cello and piano. Attila Lakatos (violin), Kriszti Magyar (flute), Ond Székely (cello), Kulcsár Janka (piano) Violin, flute, cello and piano. Li Chuanyun (violin), Pan Asia Symphony Orchestra Violin and orchestra. Daiske Nagamine (conductor), TSU Philharmonic Orchestra Orchestra. We are grateful for our parents, teachers and friends who supported, helped and guided us in every step of our lives, especially our music education. It is one of the best investment and heritage they gave us. “If I have seen a little further, it is by standing on the shoulders of Giants” – Isaac Newton. Without their fathers, even Mozart and Beethoven wouldn’t have become unfading musicians as they are. Similarly, all our talents and skills come from our parents and teachers. For GOD so loved the world that He gave His only begotten Son that whosoever believeth in Him should not perish, but have everlasting life (John 3:16). It is from the Love of GOD, that all our Loved Ones bestowed their love to us and supported us all the way through our lives.